How to Solve Toshiba Recovery Wizard Error? Toshiba Satellite series laptop & notebook system can’t be recovered with Toshiba Recovery Wizard. There are some reasons to explain. If users install AOMEI OneKey Recovery, some system problems in Toshiba will not be a big deal. Toshiba computer, is in the top 10 of global computer rating. For better to protect users’ system and some other reasons, all Toshiba computer have been preinstalled with recovery wizard designed by themselves-Toshiba Recovery Wizard, which can help users recover system to factory setting when computer crashes. as the old saying reads: ”not all diseases can be cured by one medicine”, the rationale can be applied to describe Toshiba Recovery Wizard. Some posts in computer forum always say recovery tool is error. There are some common problems collected by AOMEI Tech about Toshiba recovery software, of course, some answers to question are given. If users have encountered these problems, maybe this article can be helpful. To solve the first problem, most part of reasons is due to users’ misoperation. 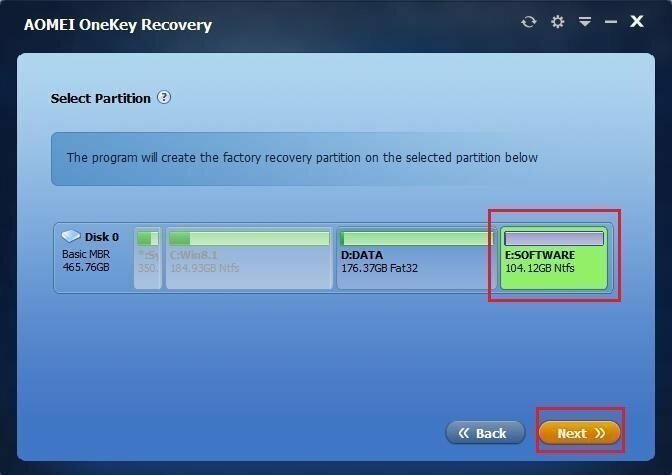 In the process of recovery, there is a step to let users choose whether recover system to factory setting or don’t change partitions in hard disk. what’s meaning? The first option means all system disk will be formatted, in other words, only one disk will be left. The second option is means only system partition will be formatted, and other partitions will be fine. To solve the second problem, there are a lot of reasons to explain. The recovery partition created by Toshiba Recovery Wizard is gone. This phenomenon often occur in novices of computer. They extend partition space by deleting recovery partition that is hidden. When computer go wrong, and they want to recover system via one key recovery, the result is what mention above. Error inevitable. The volume space of drive C or recovery partition has been changed. To branded recovery software, that is the biggest disadvantage. If users changed their space, recovery partition will be a pile of useless data that occupies disk space. The seldom of reason is because of confliction between computer model and recovery software. this specific explanation only be gave by Toshiba customer service. Actually, not only Toshiba recovery software has the disadvantages mentioned above, all branded recovery software nearly has the same disadvantages. Compared with some other software that will format system disk without any choice, Toshiba Recovery Wizard can let users choose whether format hard disk or not. So, users should pay more attention to process of recovery. As for the change of volume space of drive C or recovery partition, nearly all branded recovery software can’t solve it so far. Fortunately, some third-party recovery software have fix this weakness, such as AOMEI OneKey Recovery. If users use it to backup system, no matter how users enlarge or shrink space of drive C or recovery partition, only users guarantee that drive C’s space is larger than volume space of system image that is stored in recovery partition. 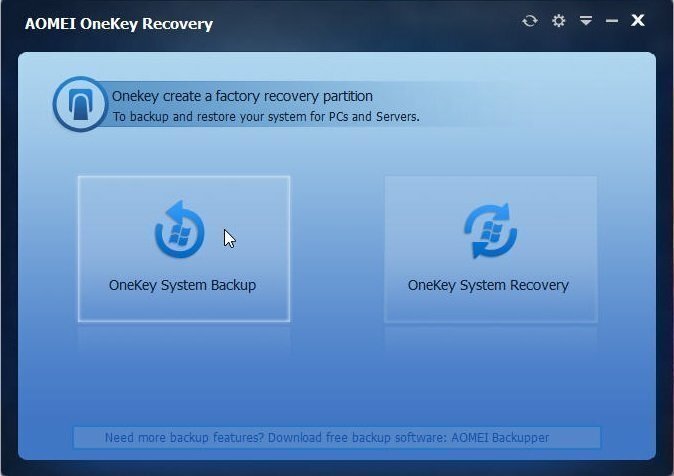 Being a third-party software, AOMEI OneKey Recovery can be installed in any laptop or PCs, of course, it has made up the disadvantage of some branded recovery software. AOMEI OneKey Recovery has a very clear and simple interface, meanwhile, it contains personal functions. Users can download AOMEI OneKey Recovery, and try to operate it. That is the interface of AOMEI OneKey Recovery, there are two button in the main interface. If system can’t be backed up before, users must click “OneKey System Backup”. If system has been backed up, users can click “OneKey System Recovery ” anytime. After clicking “OneKey System Backup”, users will see the interface like the picture below. 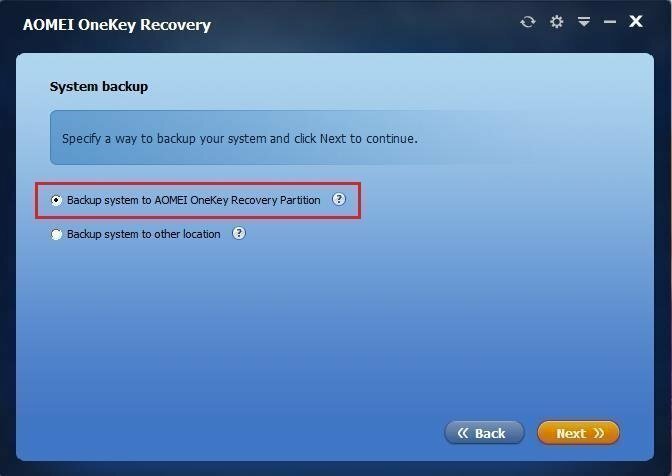 there are two options can let users to choose: Backup system to AOMEI OneKey Recovery Partition or Backup system to other location. If users choose the second option, it can back up system to any place users like, such as USB flash drive, external hard disk, etc. the first option is selected as example to teach users. You have to choose the partition which users want backup system to. The partition users select must have enough space to store system image. After users choose partition, users can click “Next”. As for recovery, it is more convenient and simple to operate. 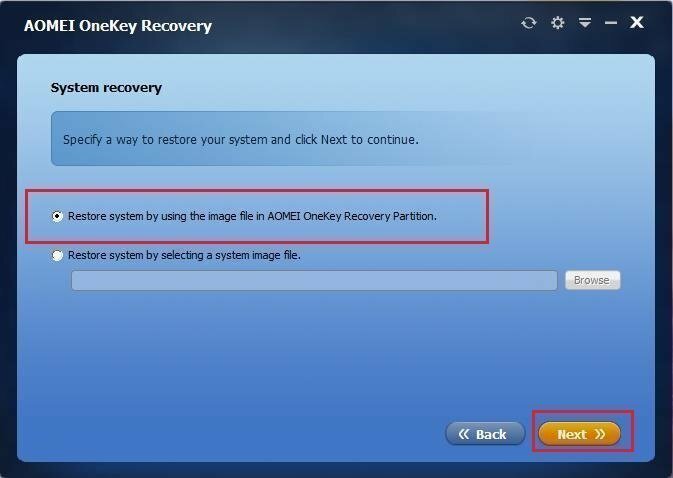 if computer is in the good condition, users can launch AOMEI OneKey Recovery; if computer crashes, please press A enter recovery software and click “OneKey System Recovery”. Then, there are also two option to let users choose, just like backup. They are corresponding to the two options of backup. 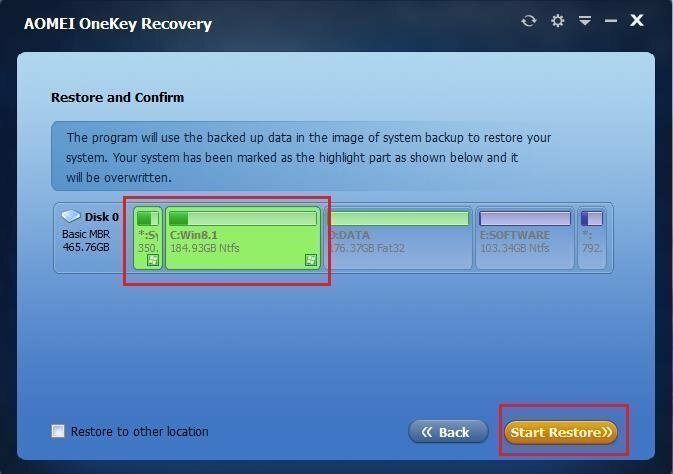 if users just back up system to AOMEI recovery partition, users are only allowed to choose the first option. Similarly, if users only backup system to other place, the second option is users only choice. Based on such rationale, users can choose any option if users once back up system in two ways. After choosing first option, users can click “Next”. The rest of steps will be finished automatically. Is it very simple? In the whole operation, users don’t need to worry whether partition’s space has been changed or data in partition will be formatted.